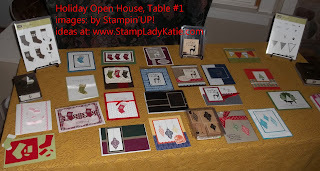 The Holiday Open House is Tomorrow so today is a very busy day for me. Busy, but fun! 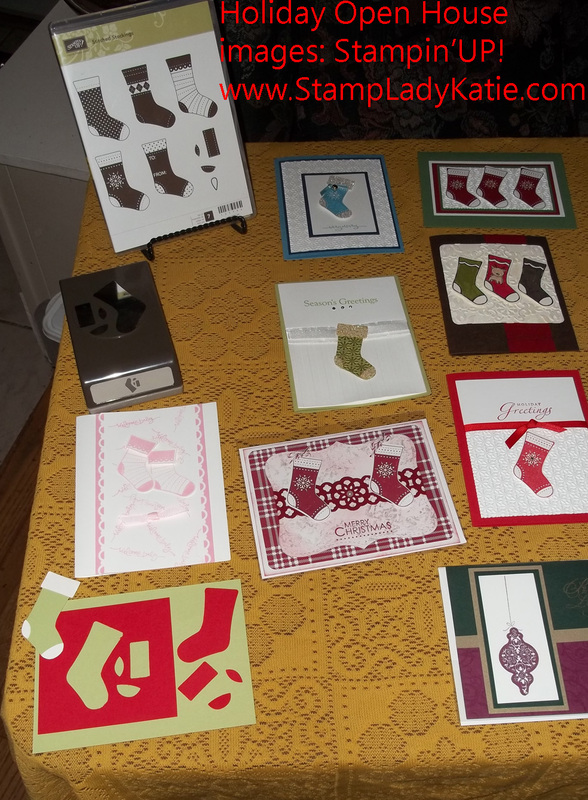 I have 6 tables of cards, gifts, gift tags, and more . . . The samples will be arranged either by stamp set used or by the tool used. 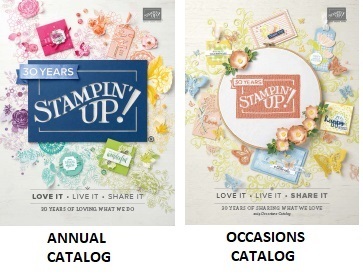 This table shows 4 stamp sets: Dasher, Pennant Parade, Tree Trimmings and a new set called Stitched Stockings (which you can see in the new Holiday Mini Catalog: view it online HERE. AND: The new stamp set has a matching punch! You can see it in the lower left corner of the pictures. The stamp set has 5 different stocking designs and separate stamps to stamp the toe, heel and cuff. The punch is sized to match the shape of the stocking itself and the shapes of the toe, heel and cuff. When punching a stamped image remember to stamp first, then punch. Its easy to get a perfect punch by looking through the opening in the bottom of the punch to line up the images. The close up shows a stocking that was just punched, not stamped. 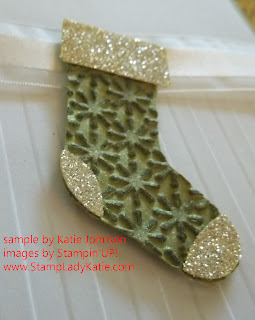 The stocking was punched from Old Olive paper and then embossed with the Snow Burst embossing folder. This is a new folder, also found in the Holiday Mini. The embossed image was sponged with Old Olive ink to give it more definition. The cuff, heel and toe were punched from the new Silver Glimmer Paper. Now, if you think this doesn't really look silver, you're right. The silver seemed too bright for this card, so I sponged Daffodil Delight onto the glimmer paper and it worked just fine! Wow, you can color the glimmer paper. 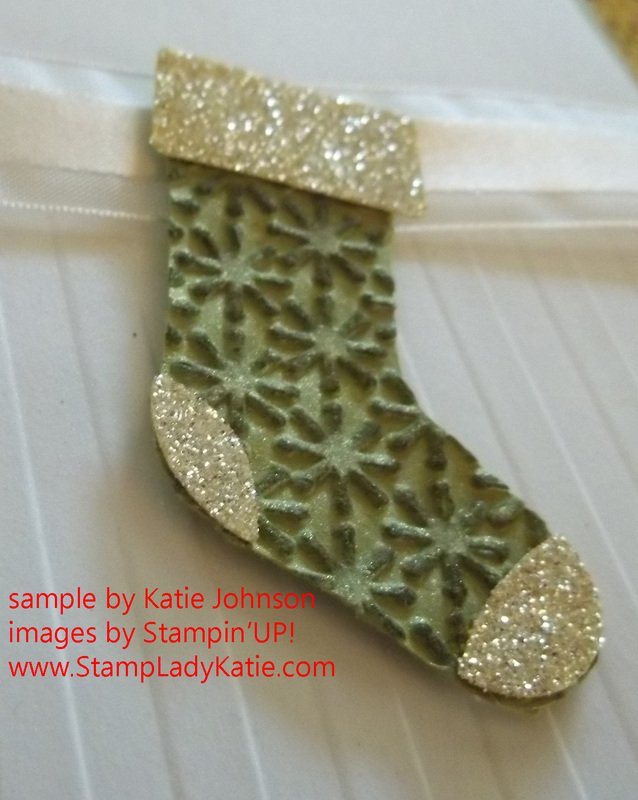 I wanted the stocking to look like it was hanging, so I embossed the background with the Stripes Embossing Folder. Here is a quick supply list. During October, buy 2 Simply Sent Card Kits and get a FREE matching Stamp Set. These cards come with the images pre-printed and already folded. 8 to a package with envelopes. You just add a sentiment and/or an embellishment. The embellishments come with the kit. See more details here. Only 6 days left to get $100 of FREE merchandise - yep that could even be the Big Shot. 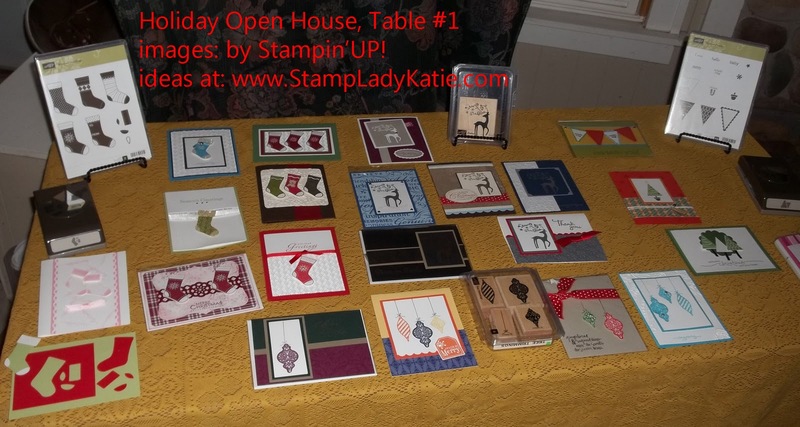 Join Stampin'UP! during October and get a Free Big Shot or $100 of additional merchandise free. This is a NO OBLIGATION promotion. You join. You get the free stuff. And more . . . You have access to a company sponsored demonstrator only website for sharing samples. You will be WOW'ed by what you see here! You also get a 20% discount on all purchases for the next 3 months. After that its up to you whether you continue or not. No Obligation means just that. But also know that I support my downline. By joining me you will also have access to an exclusive website with additional training materials and project ideas. 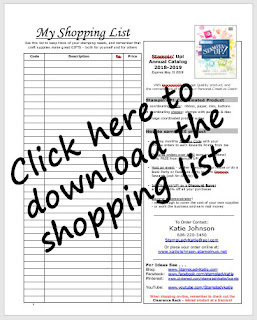 You'll see far more samples on my downline website than what you see on this blog. 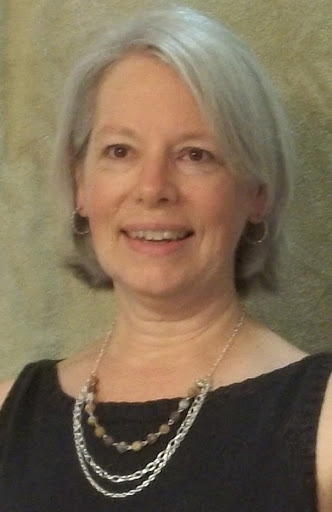 I'm just not able to post everything to the blog but I do post all my workshop and class samples on my downline website. Contact me TODAY to discuss how this can benefit you. Remember, this is only available through October, there are only 6 days left to this promotion. What will you get with your free $100? Get your questions answered by calling 608-220-3450 or by email. It's me, Nola from LNS--love to check out and see what other Demos' are doing on their blogs--yours is GREAT--I LOVE this idea of stuff your stockings ---gets me thinking about holding an even like this for my group here in Mass. Hope to meet you in S/Ant, TX--Leadership 2012 will be GREAT!